Welcome to Helping Hands, a charitable organisation working in support of disadvantaged children in Curitiba, Brazil. Although Brazil has the largest economy in South America it is among the most unequal in the world. Half of the country's 60 million children live in poverty, of which a significant number are in city favelas (shanty towns). Poverty, inequality and social injustice has led to a level of violence in some cities which ranks amongst the highest of any region not at war. Educational opportunities for Brazil's poorest children are very limited, resulting in widespread illiteracy and thus reinforcing the cycle of poverty and misery. 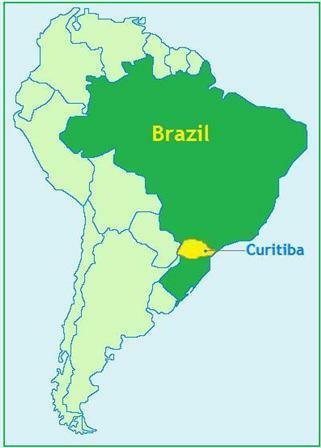 Curitiba is the capital city of the Brazilian state of Paraná (shown in yellow on this map), which sits on a plateau at over 3,000ft above sea level. Such altitude is responsible for cold temperatures untypical in the rest of Brazil. The weather is rainy and very variable even within the same day and the flatness of the terrain hinders quick water drainage after rain. With a population of over 2.4 million people (2014) it is home to many city favelas.